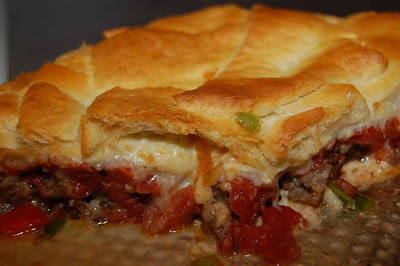 Empty nest...Let's Do Lunch: Sausage Pie - looks Fantastic, tastes Delicious! In a bowl combine tomatoes with basil and black pepper. Set aside. Brown sausage meat breaking it up with a fork to keep separated. Drain off fat, add chili powder, oregano, basil, 1/2 cup of cheese, green onion and red pepper. Stir and set aside. Here is the easy part that makes this recipe a Wow. Open one package of dinner rolls and unroll. Cut the dough in half along the perforated line. Mold one half of dough into the bottom of a 9 inch springform pan. Covering the base completely, pinch together any sections that have separated. Fit the remaining dough around the sides of the pan, pinching together any sections that separate. Spoon sausage mixture over dough and press down. Spread the tomatoes over the meat and sprinkle with remaining cup of cheese. Now, open the other package of rolls and lay flat, pinch the seams together and with a pizza cutter cut strips that will be used to make a Lattice pattern over the filling. Gently roll the dough that is above the lattice down to cover the edges of the lattice strips. Bake 35 mins or until top is golden brown, then cover loosely with foil and continue to cook 10-15 mins longer. Remove from oven and let cool 5 mins before removing outer ring and cutting. Serve with a green salad and wait for the Raving to begin! !